Apartment on the second floor of a building with elevator in the center of Malgrate, which overlooks a beautiful plot of 6000 square meters, and has a view of the lake. It 'consists of a living area with kitchen equipped of induction plates, combination microwave, dishwasher and refrigerator. The relaxation area has a smart TV 48 ". There are a spacious room with two single beds and a large double room. The dressing room is equipped with washer-dryer and bathroom with shower and hair dryer. It 'been furnished with great care and attention to detail. And 'the only apartment across the street, with private parking space !!! The land adjacent to the house, large 6000 square meters, and 'too exclusive and the guest can freely use, in compliance with good education, enjoying the view and the fruits that seasonally, the many trees planted, will provide. heating, and wifi internet included. Possibility ', on request, in the shop directly, the shopping delivered at home. Check-out by 09:30 a. m.
Check-in time starts at 15:00 p. m.
The historic center of Malgrate, a 10-minute walk from Lecco, it's a little hidden gem. Narrow streets and hidden alleyways that descend directly to the lakefront recently set up with green spaces and water features. To frame in all the mountains, all of the Resegone, and in the evening spectacular sunsets, shimmering water and Lecco lights create a truly impressive sight. Malgrate connects Lecco with a bus service, walk through the lakeside or with bicycles made available by the City. Lake Como is dotted with small charming villages, with unique architecture and superb views, also reachable by boat: Varenna and Bellagio are the best known. For windsurfers, kite or sail to the nearby Bay of Pare '(2 min drive). Bathroom consists of dressing supplied washer dryer and sink and a bathroom with shower and hairdryer. Spacious and tastefully decorated apartment. Comfortable and spotlessly clean. Well-equipped, lots of storage space, plentiful hot water and towels. Great location just a few minutes walk from the lakeside and from there a pleasant 30 minute walk into Lecco. Although on a small side street the apartment is extremely noisy - lots of traffic noise every day made worse at the weekends by motorbikes. Church bells start at 7am each day and continue throughout. Also lots of noise from the ?church/school round the corner most days including talking and music through a PA system. The apartment does have a large garden but there is no seating or really any usable space outside as it is so overgrown. There is no air-conditioning at the apartment ( maybe building regulations do not permit in these lovely old buildings - understandable ) but no fans?? The temperature during our stay was high 30s and with no means of cooling the place down the heat indoors, particularly at night was unbearable. All in all though we did have a very enjoyable holiday. Excellent modern apartment for up to 4 people. My family and I spend 5 days at Simply Wonderful. Firstly we were late, but Paola made no fuss, just texted us to see if we were ok. 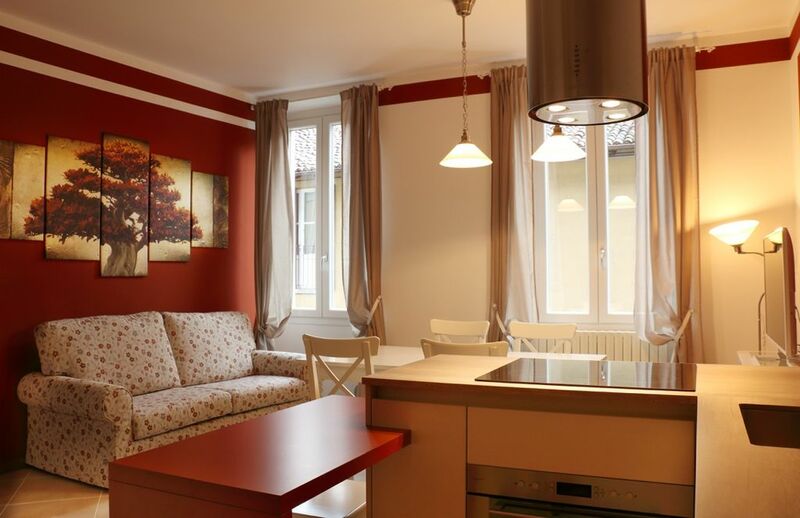 The apartment is perfect for 4 people, fully equipped, spacious and everything is new and modern. Paola is very friendly and kept in touch with us by text throughout our stay, even though we didn't have any problems. There is safe, secure parking also and the neighbourhood is very safe and peaceful. There is s small shop and some restaurants right nearby, with the larger supermarkets and busy town 15 minutes away. I would recommend Simply Wonderful to anyone who wants a quiet peaceful holiday on Lake Como or as a base for travelling around Lombardy. Nice apartment in a great location. Newly renovated, clean and spacious, it met all of our needs for our family of 4. Strong wifi, parking and laundry were all appreciated. Malgrate is a lovely spot just across the lake from Lecco, a 15 minute walk away. The lakefront is pleasant for admiring the view while enjoying a drink or gelato. There is even a bike sharing station at the lake right near the apartment. You just need to go into Lecco to sign up. Highly recommended. Thank you very much for your lovely review. I hope to welcome you again in the future. A big embrace to your very polite children and good luck for the going on of your trip. Thank you so much for the wonderful words you wrote. Hope to accomodate you and your family again in a future. Perfekte Abwicklung, sehr höflicher und freundlicher Kontakt. Alles toll, wir haben unseren Urlaub in der Ferienwohnung absolut genossen. Nel prezzo dell'appartamento è incluso un posto auto privato.